It means the butterflies are no longer caterpillars. They have transformed. Thank you for your reply. Yes, literally, I completely agree with you that “it means the butterflies are no longer caterpillars. They have transformed.” And they are free and ready to fly. “Butterflies Are Free To Fly” offers a new and radical approach to spiritual evolution based on the recent scientific experiments in quantum physics and brain research outlined in Part One. Given that the physical universe which looks and feels so real to us is actually a unique holographic projection from our own brain, the author examines various models for life and living that are very different than what we have been told and taught. 有一次, 我的心情很沮喪, 師父見狀即以您的文章 – 一切事情的發生, 都是最好的安排, LINE 給我看. 這篇文章是我見過最喜歡的文章, 它將會在今生中給我不斷地鼓勵, 這是您寫的嗎? 覺得似曾相識, 是不是在前世今生系列的文章? 您說這篇文章是您所寫,實在令人讚嘆. 我又拜讀了其他幾篇文章,深得我心,非常感謝. 字裡行間都是正能量, 讀來心有戚戚焉. 感恩! Can someone contact me please. I have written before. Sorry. Your previous contact email was probably lost somewhere in the process. Please send your comments again in replying to this message. I am writing to get the authorization to use your drawings in a book on the history of medicine in China. Also, you write that the ancient Chinese “used a pole about 8 feet long, posted at right angles to the ground and recorded positions of the shadow…” what is the source of this information? Allen is currently out of town now. So I am replying this message for him. You are writing a book on “The history of medicine in China”. It is an interesting subject, and there are a lot of such books written in Chinese. Therefore, I guess that you are writing the book in English. The subject is so vast that you are probably written some specific aspects of it, like Acupuncture and moxibustion. The Bible of this subject is “黃帝內經” (The sutra of the Yellow Emperor). “太極陰陽圖的由來” 一文裡的圖，來自網路。其原作者不詳。版權不屬我們。譬如，太極圖，網路到處都有，甚難分辨版權屬誰。”日中立竿測影” 一圖，時代久遠 ( > 三千年)。The figures in the article “The Origin of Taiji yin yang figure” came from the internet. We don’t own the copyright (and we don’t know who owns the copyright). They are ancient. For example, you can find all kinds of太極圖everywhere, and the “日中立竿測影” figure probably dated back more than three thousand years. How ancient Chinese measuring the shadow of a long standing pole at mid-day? They used two tools: one is an erected eight feet long pole, and the other is a marked wood bench lining along the meridian. After years of observation, they found that, at mid-day, the length of the shadow, oscillated between the furthest point and the nearest point, once every 365.24 days per year. 它記載於《周髀算經》。《周髀算經》是一本古老的『蓋天天文學』，是周公詢問包犧訂立天體經緯的方法而起的。It is recorded in the 周髀算經, which is an ancient Chinese astronomy book. This book was written during Zhou dynasty (more than 3,000 years ago). Thank you to answer the question for me. Let me add some lines. The source is from the book of “Zhou-Bi Suan-Jing” 周髀算經 by unknown author probably before 100 BC. The book mentioned 8-foot-long Zhou-Bi 周髀長八尺 and measuring shadow with pole at noon 日中立竿測影. Zhou 周 is Zhou dynasty. Bi 髀 is the meter. Zhou-Bi is an astronomical instrument using in Early Zhou dynasty around 1111 BC. Zhou-Bi is required a level ground foundation. Then it’s called “Gui” 圭, which is double Earth 土, stronger Earth. 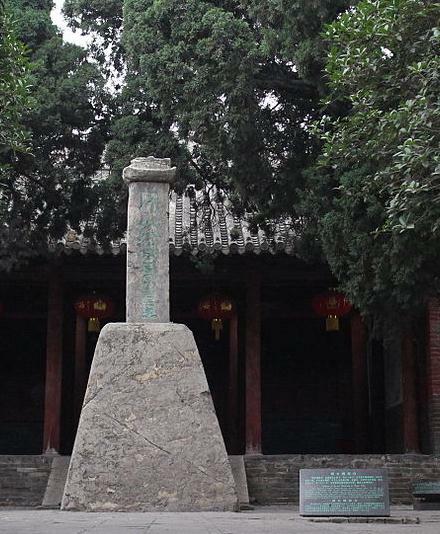 Zhou dynasty didn’t use the pole anymore. Later, the pole is replaced by longer stone and metal for accuracy purpose. The length of Chinese foot varies from dynasty to dynasty. The foot of Early Chou dynasty is 19.7 centimeters. 8-foot-long Zhou-Bi is about the height of a man. The foot of Late Chou dynasty is 24.63 centimeters. 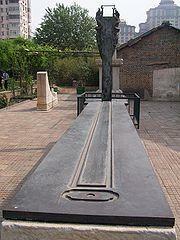 The foot of Han dynasty is 27.7 centimeters.